Yep, The Self-Publisher’s Ultimate Resource Guide rocketed to #1 and #2 in two of my target categories. Just with preorders. Only a few people have even seen the book up until now. Now it’s publication date, and I’m very excited to get this book into the hands of the people who need it the most—authors starting to look around for the resources, vendors, and products they’ll need to move them along the publishing journey and get their books to market. And not just any books. As always, I’m focused on helping you create well-made, industry-standard books to educate, entertain, and enlighten your readers. That’s what I do. 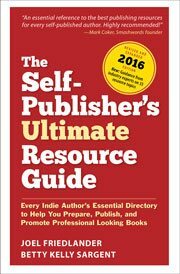 I love bringing you great writing, like yesterday’s post on the state of play in the world of ebooks, to the dozens of nuts-and-bolts articles that appear hear on editing, book marketing, book design and production, ISBNs, book distribution, copyright, and all the other topics we cover specifically for indie authors. Now I want to ask something from you in return. I took this project on at the suggestion of my coauthor Betty Sargent, because I knew just how useful it would be. Imagine, a whole ebook full of hundreds of curated, verified live links to easy-to-find resources you’ll need to publish your book. At the retail price of $7.99, this can be one of the best purchases you make when you decide to get into indie publishing. One way you can help is by helping us make the Resource Guide a better book. We’re actively soliciting contributions from readers for people who should be listed in upcoming editions, and we’ll continue to update the ebook version regularly. You know me, I just can’t let an opportunity go by without offering something in return. 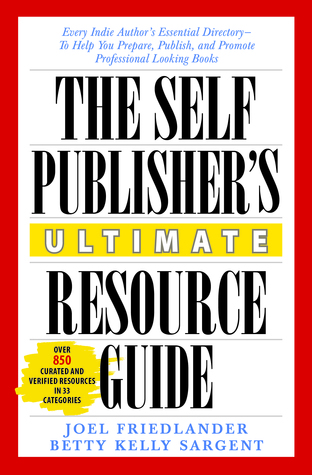 During our launch period, ending January 11, 2015, we’ll be offering every buyer of The Self-Publisher’s Ultimate Resource Guide a $15 coupon to use on BookDesignTemplates.com, where we have pre-designed book interiors for Microsoft Word and Adobe InDesign as well as tools like our Media Kit for Indie Authors that will help you publish better, faster, and smarter. Yep. Invest $7.99, get $15 back. Simply email me your purchase confirmation or sales receipt showing the title of the book, and I’ll immediately send you a coupon code to use on our site, saving you $15. Use this email only for sending a purchase confirmation or sales receipt. For questions about the program or problems, email marin.bookworks@gmail.com and we’ll help out. This is a book you’ll want to have next to you as you plan your upcoming book productions, and one that makes a great and affordable gift for other authors. So go buy it already. I want to thank Betty Sargent for partnering with me on this project, her team for working so hard on the research that went into the book, and to Shelley Sturgeon, Tracy Atkins, and Kate Tilton who are a great team to have on my side. And most of all, thank you for making it all possible. will this book be relevant to us in Australia? Thanks for including me, Joel! I’ll definitely be referring my clients to this great resource, too! My pleasure, Eliza, and thanks for your support. Thanks, Joel, for including me in your book. I just bought my own copy, as I’m working on revising my next novel, and will make good use of it, I’m sure! I’ll definitely tweet this! Good for you! A welcome resource. Thanks so much, Michael, I really appreciate it. Joel, thanks for continuing to provide such useful info to all of us indie authors! Much appreciated. Congratulations on your launch Joel! I’m sure a lot of people have been waiting for a resource book with current and vetted links. I’ll sure get my copy. Thanks, Susie, and put me down for a copy of your book when it’s ready, too. Posted to RWA group and my FB page – looking forward to using this! I have used information from several of your blogs – good job! Now where is the print version so I can fill it with sticky notes! Exactly, Kim, it’s almost a form of self-defense from the massive number of requests for referrals. Thanks for your support. Thanks for including IBGW in your listings, Joel! I’ll announce the publication Monday on the blog. 🙂 WRITE ON! It has been such a pleasure working on this project. I am so thrilled that it is now out in the world! Couldn’t have done it without you Kate, thanks for all your expert help. Well deserved, Joel and Betty! Thanks Jason, really appreciate it.